Leah Trujillo has made up for lost time. For six months the nine-year-old received her chemotherapy treatments for PH+ ALL mostly isolated in her hospital room. Because of frequent bouts with neutropenia, Leah was at increased risk of developing serious infections. There were too few white blood cells needed to fight off harmful viruses and illnesses. For her own protection, it was best she stayed separated from the rest of the patient population. Things can get a bit lonesome day after day behind closed doors. 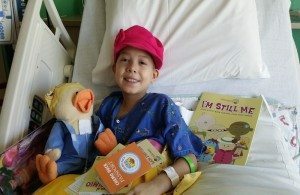 Thankfully, a child life specialist at the Children’s Memorial Hospital in Colorado Springs introduced her to Chemo Duck. There was an immediate connection, said Leah’s mom Charis Trujillo. According to Charis, the two are rarely apart. “It was truly a lifesaver,” said Charis. “The day Chemo Duck was given to her, she wasn’t feeling well at all. It had been a really, really rough day. That night Charis spent hours making videos of her daughter playing with her duck. Chemo Duck has served as a great tool for Leah to educate her family about the therapies and routine medical procedures she experiences, said Charis. Trujillo is thankful that people from all over the country are in tune to the positive impact Chemo Duck has on pediatric cancer patients. She knows that the generosity of donors allowed her youngest daughter to be empowered by a yellow, pajama clad, 12-inch stuffed animal. Sometimes the biggest gifts come in the smallest packages.